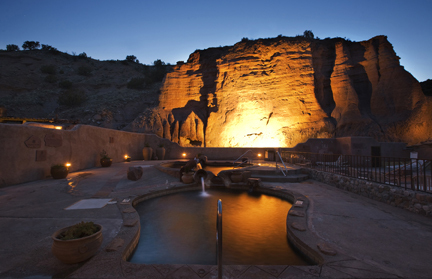 The spa resort of Ojo Caliente offers a rare chance to experience the remote beauty and rarefied mountain air of northern New Mexico. Rare precisely because of the remoteness which drew artist Georgia O’Keeffe to what she described with satisfaction as “the tail end of the earth” where friends would never find her. O’Keeffe may have wanted to be alone with the stunning landscape, but she was nevertheless lured now and then from her home in nearby Abiquiu to bathe in the natural hot springs. Visitors can go one better, staying over in the comfortable resort, incorporating an excellent spa, built over the springs. We stayed in “Plaza Suite” rooms, among the newest and best in a wide range of accommodation options to suit every budget, and much more rustic than the name suggests. Furnished in traditional New Mexico style with bright textiles, they opened on to a central patio with access to a pool more private than the larger one open to the public who visit just to take the waters. However, the real treat is to book a private pool in which to soak with only your nearest and dearest, overlooking the mountain landscape and warmed by an outdoor fireplace in the run-up to dusk – a magical experience. 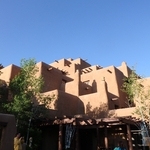 The spa harnesses local herbs and other ingredients, and pays homage to Native American massage techniques and rituals. There’s also a yurt in which to celebrate yet another beautiful day with a yoga session. The Artesian restaurant serves better food than its unfancy appearance suggests, from hearty southwest breakfasts featuring eggs, chiles and tortillas in various combinations to more cosmopolitan dinners. The wine list is decent, and a glass or three can be enjoyed in a lively wine bar. 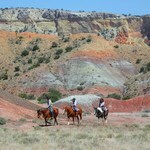 As well as O’Keeffe’s Home&Studio in Abiquiu, it’s worth visiting wild and beautiful Ghost Ranch 15 miles beyond, where the artist lived in summer and painted her best-known landscapes. Book both visits well in advance, as numbers are limited – the Jeep tour through O’Keeffe’s landscapes is particularly recommended. 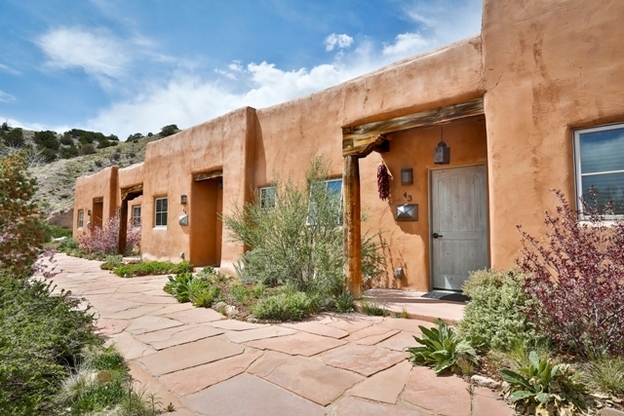 Northern New Mexico’s prime dining, shopping and cultural action may be an hour away in Santa Fe, where most visitors stay, but to drink in the landscape which inspired the artists who made it a town of galleries, you have to come to the source of what earned New Mexico the nickname Land of Enchantment. 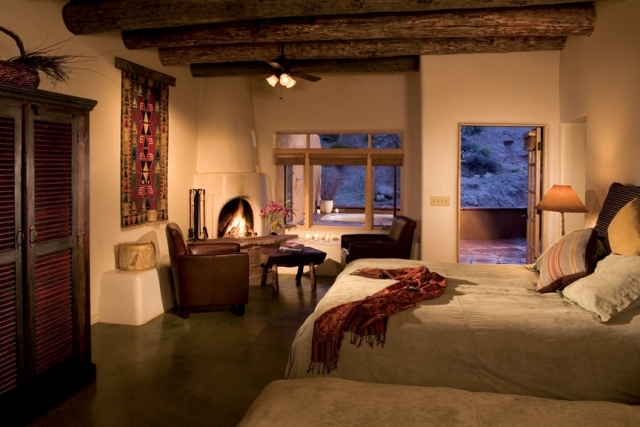 Ojo Caliente is a rare oasis in an untamed stretch of magnificent and relatively untravelled big-sky country.